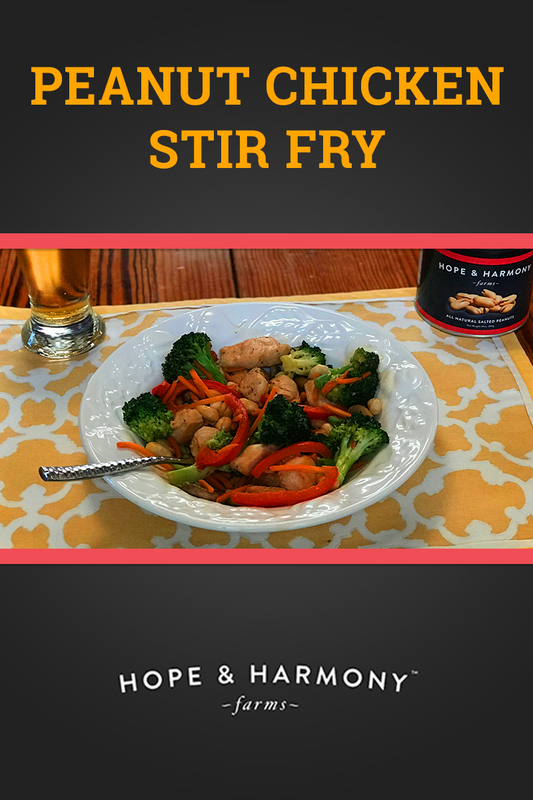 This quick and nutritious stir-fry recipe is a classic favorite which is sure to please the whole family. The popularity of stir-fry recipes is in part due to the speed in which they can be prepared, cooked and on the table. The ideal weeknight meal for busy moms and dads! To make the sauce, whisk together soy sauce, peanut butter, honey, peanut oil and freshly grated ginger in a small bowl. Whisk in 3 tablespoons of water. In a large skillet over medium heat, drizzle peanut oil and add chicken. Season with salt and pepper and sauté until browned; about 3 to 5 minutes. Add the garlic and sauté for about 1 minute, mixing it with the chicken. Add broccoli, bell pepper, mushrooms, sugar snaps and carrots to the skillet; sauteing for an additional 6 minutes. Once the veggies are tender and the chicken is cooked through, add peanuts and green onions, and drizzle the peanut sauce over the top of the vegetable mixture. Incorporate everything together with the sauce, coating well, and cook until heated throughout. 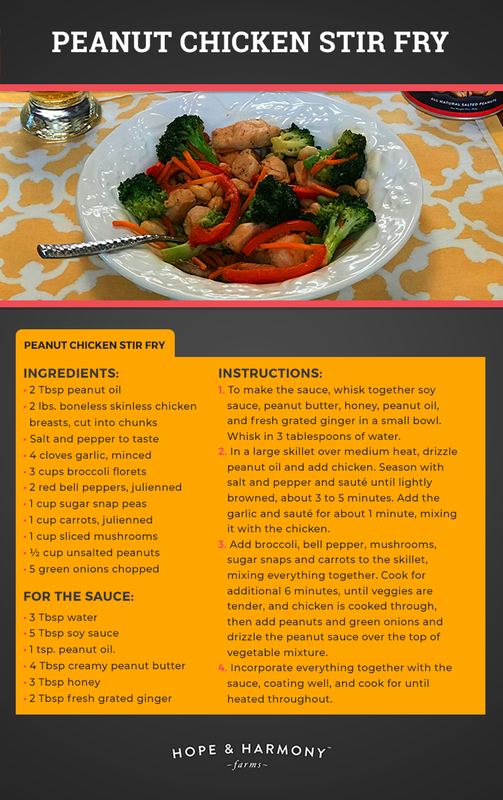 This Peanut Chicken Stir-fry keeps everyone happy with its full-bodied taste and nutritional profile. Although most ingredients work well in a stir-fry, try to fight the temptation to include the entire contents of your refrigerator. Select the right combination of fresh vegetables and top with Unsalted Peanuts for a light dinner with a rich crunch. Over a century of farming the world’s finest Virginia peanuts has given us plenty of opportunity to experiment with and create the perfect recipes for each unique palette. A blend of honey, peanut butter, and a healthy dose of savory ingredients makes for a dreamy weeknight recipe. Our Green Peanut Oil is packed with nutritional goodness: it’s cholesterol free, can aide in helping you maintain a healthy blood pressure, and an ideal alternative to cooking with vegetable oil.